The balance between pro- and antiinflammatory cytokines may be important in malaria presentation and outcome. Malaria tends to be more severe in children than in adults, presumably because partial immunity develops with age. However, the full nature of, and age-related differences in, anti-malarial immunity are unknown. We compared: (1) serum and cell-specific cytokines of patients with acute malaria to those of patients with other acute illnesses and to those of healthy adults and (2) the cytokine responses of parasitemic children and parasitemic adults. Flow cytometry was done on the peripheral blood mononuclear cells of 148 hospitalized children, 161 febrile hospitalized adults, and 20 healthy adults in Malawi, Africa, a malaria-endemic country. Serum cytokines were also assessed for 80 of these patients. Thirty-eight participants were parasitemic with Plasmodium falciparum. Serum interleukin (IL)-10 (an antiinflammatory, immunoregulatory, and type 2 cytokine) levels were higher in malaria patients than in other patients (medians 502 pg/mL vs 16 pg/mL, P = 0.002), and the percentages of various lymphocyte populations making IL-6 (a proinflammatory, type 2 cytokine regulating iron distribution) were lower in malaria patients than in other patients (e.g., for spontaneous production by children’s CD8(+) T cells: medians 1.4% vs 33.1%, P = 0.004). For adult patients, the percentages of lymphocytes spontaneously making IL-4 (a type 2 cytokine) were significantly lower in those with malaria than in those without malaria (medians 0.9% vs 2.1%, P = 0.005). The percentages of monocytes spontaneously making IL-8 (a chemotactic, proinflammatory chemokine) were higher in parasitemic children than in parasitemic adults (medians 5.8% vs 1.7%, P = 0.003). A number of cellular proinflammatory, type 1 parameters were significantly higher in all children (with or without malaria) than in all adults; these included the percentages of various lymphocyte populations making IL-6, both IL-6 and interferon-gamma, or IL-8. These data support the importance of IL-10 in malaria parasitemia. Given the lack of an IL-4 (type 2) response, IL-10’s primary role may be immunoregulatory rather than type 2 in nature. 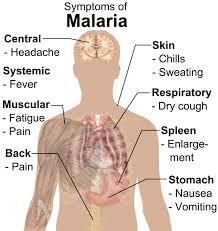 In this study, the immune response to malaria was more proinflammatory in children than in adults. This difference, if corroborated by other studies, could be related to malaria’s greater severity in children.